USB and Ethernet dynamic signal analyzers provide accurate measurements for portable sound, vibration, and force response. Directly measure IEPE-type accelerometers or voltage inputs with no added signal conditioning using USB and Ethernet data acquisition (DAQ) devices. DT9847-2-2 USB Dynamic Signal Analyzer; 24-bit, 216 kHz, 2 IEPE AI, 2 AO. 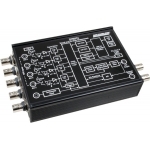 USB Dynamic Signal Analyzer; 24-bit, 216 kHz, 2 IEPE AI, 2 AO. DT9847-3-1 USB Dynamic Signal Analyzer; 24-bit, 216 kHz, 3 IEPE AI, 1 AO. USB Dynamic Signal Analyzer; 24-bit, 216 kHz, 3 IEPE AI, 1 AO.